NOTE: This tutorial is terribly out-of-date. The first part of my All New, Comprehensive Guide to Using Mecanim Animations in ORK has now been posted. It supersedes anything that I previously wrote here. 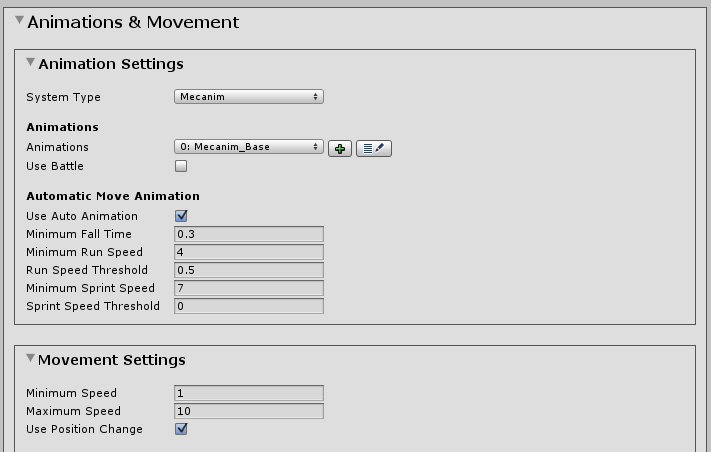 Here is how to set up Mecanim animations so that each weapon (or weapon type) can have its own set of animations. I am going to assume that you are familiar with the basic setup for Mecanim animations, as outlined in this tutorial or this one in the ORK tutorials. This tutorial will make heavy use of Mecanim sub-state machines. These allow you to encapsulate the logic for a particular set of animation states and keep your main controller graph uncluttered (or less cluttered). I'm using the Medieval Animations Mega Pack by Mister Necturus in my project, but you can use whatever sets of animations you like. This pack includes general (unarmed) animations, one-handed sword (& shield), two-handed sword, bow, spear, and wizard (staff, spells) animations. For the purposes of this tutorial, I'm just going to stick to: unarmed, one-handed, two-handed, and staff. I will also assume that the equipment viewers for weapons (in hand) are hidden in Field mode and visible in Battle mode. So we will be creating a set of Battle animations for each weapon type. If you want the weapons to be visible outside of Battle mode, you can adapt this approach to do so. 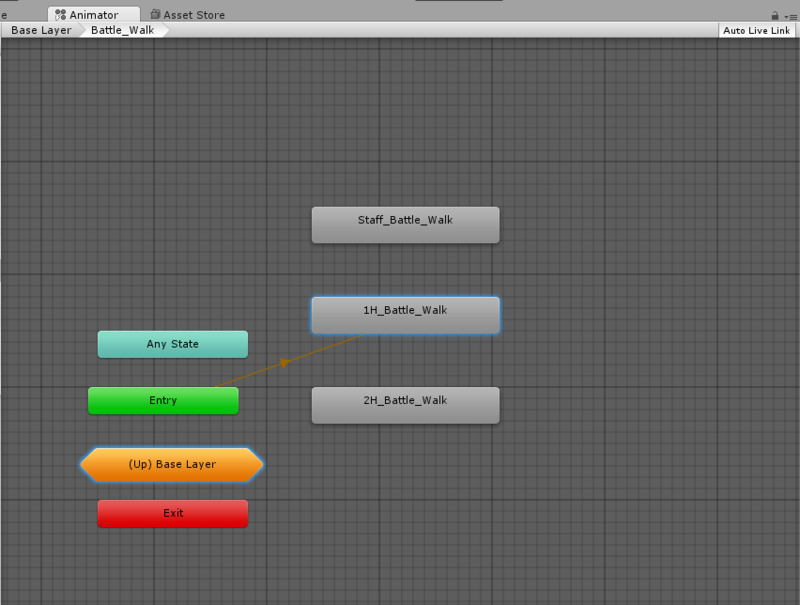 The key to getting the correct set of animations to play is to make use of an additional parameter in your animator. Create a new parameter called weaponType of type Int. When a battle starts, combatants will be in the Idle state . They will remain in this state while selecting actions, and they will return to this state after performing an action. I'm going to split the Idle (field mode) state off from the Idle(battle mode) state to keep things more organized. 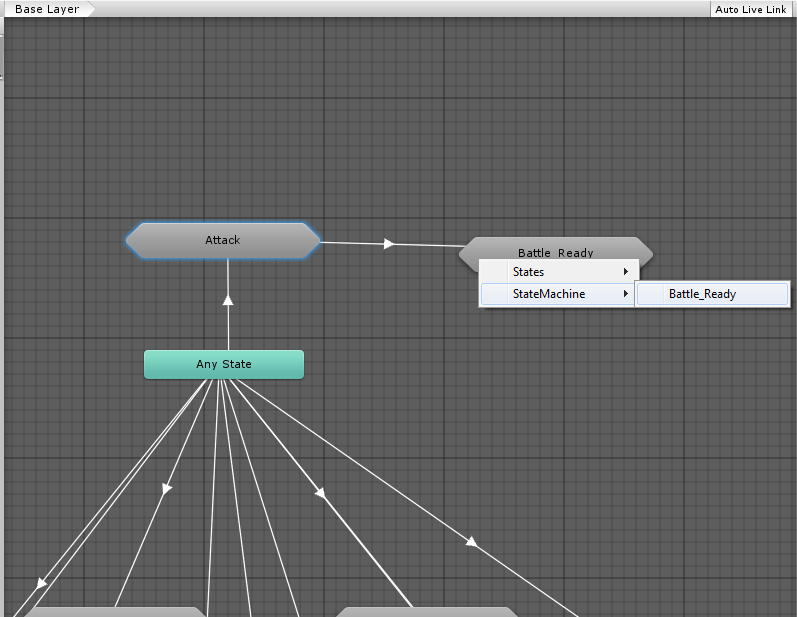 So create a new Sub-State Machine in your animator called Battle_Ready. Double click on it to open it up. You can return to the Base Layer via the breadcrumbs at the top left of the Animator window. Create a transition from Check_Weapon_Type to 1H_Battle_Ready. Make sure you uncheck "Has Exit Time" or else the character won't reach the appropriate battle ready state! Add the condition: weaponType Equals 1. Now create a transition from 1H_Battle_Ready back to Check_Weapon_Type. Make sure "Has Exit Time" is unchecked. This time add the condition: weaponType NotEqual 1. Repeat this for the rest of your weapon types, but using the appropriate weaponType value instead of "1". So what happens here is that when ORK plays the Battle_Ready state, the first thing that happens is that it checks the weaponType parameter before playing any animations. When the character is already in the appropriate Battle Ready state, equipping a new weapon will change the weaponType, so it will transition back to the evaluation state and ensure the correct battle idle animation is played. 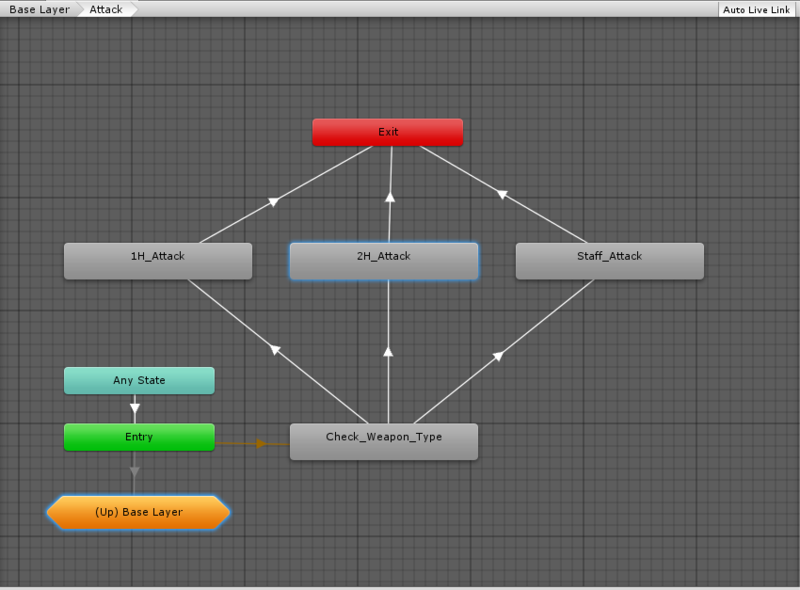 Let's set up the attack animation in the controller and then we'll look at how to set up your animations in ORK. 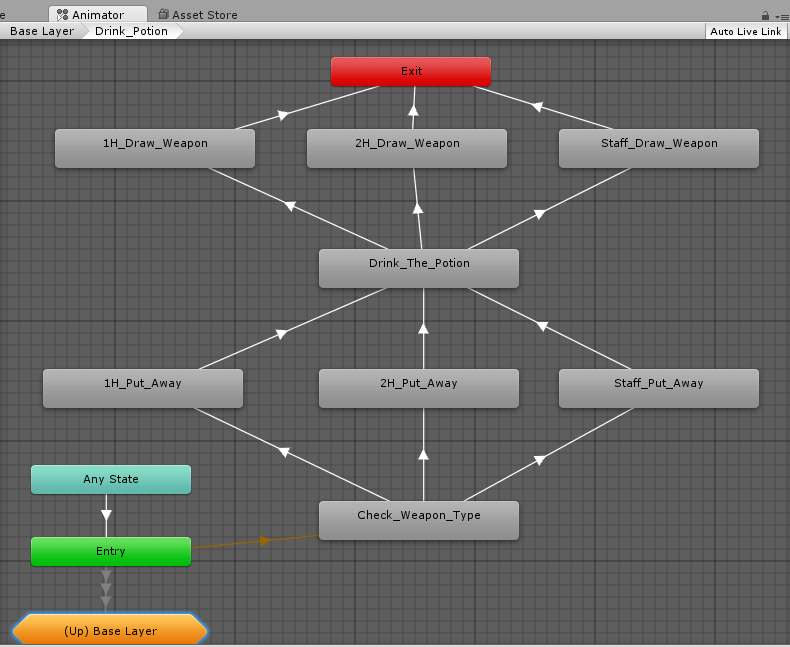 The pattern that we use here will be re-used throughout your animator controller. This one starts out the same as the Battle_Ready state machine, but this time we'll allow the state machine to exit once the animations have finished playing. 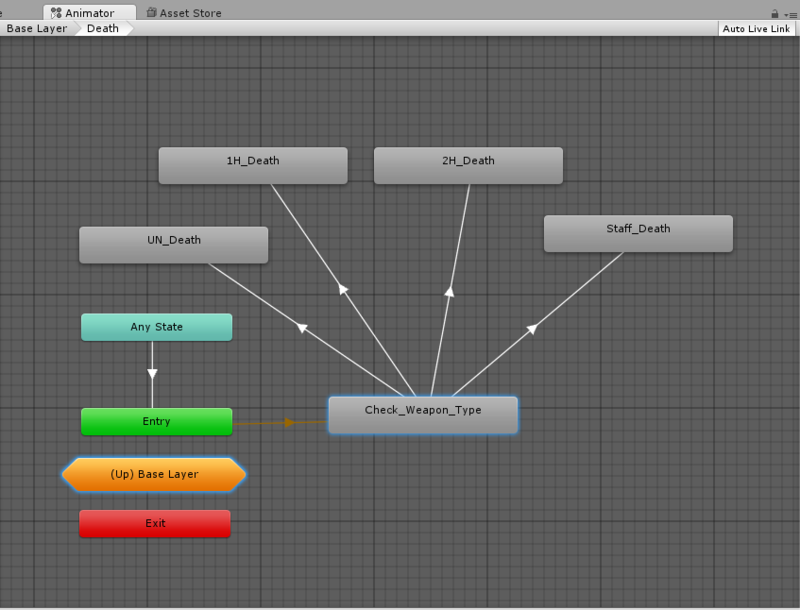 Now go back to your Base Layer (via the breadcrumbs in the upper left of the Animator window) so we can connect the Attack Sub-State Machine that we just created to the rest of our controller. As in the basic tutorials, you want to ensure "Has Exit Time" is unchecked and add a condition for your attack parameter (which should be a trigger). No conditions are necessary for this transition. This works on the same principle as in the basic tutorials, but adds a new step. 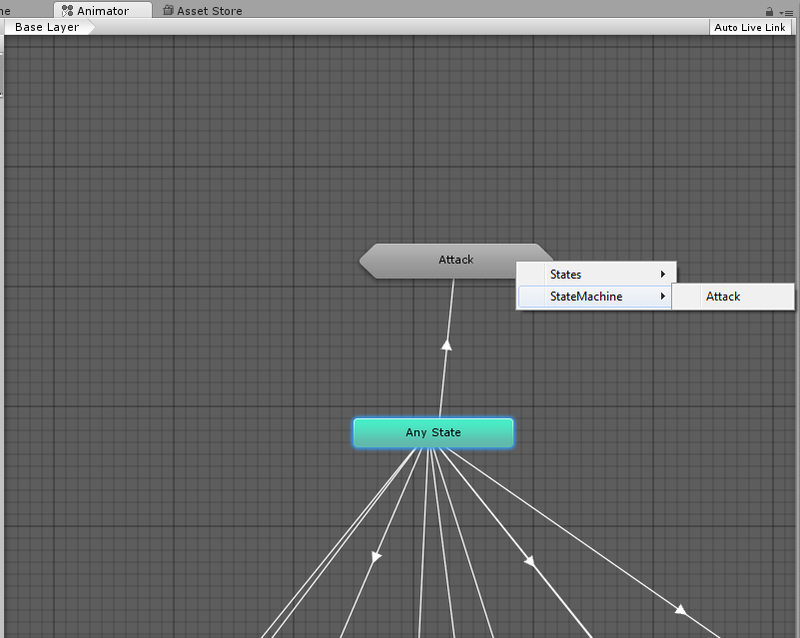 When the attack trigger parameter is received by the Animator controller, it moves to the Attack state. 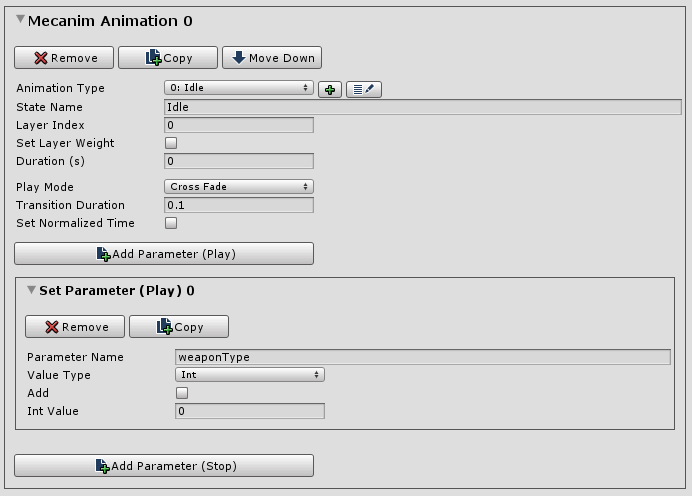 Instead of immediately playing the animation, it checks the current value of the weaponType parameter (of integer type) and plays the appropriate animation. And when the attack animation is finished playing, it will automatically Exit the sub-state machine and transition back to Battle_Ready (the combat idle). When you set a parameter of type int, float, or bool on the Animator controller, the value remains set until you change it again, unlike a trigger which has no persistent value. Thus, when we set the weaponType when playing the battle idle (Battle_Ready), we only need to set it again when changing weapons or when combat ends. If you want the weapon to be visible outside of battle, then this same approach will work, but you may need to set the weaponType parameter on many more ORK animations (and thus have to override all of those in your weapon-specific sets). This isn't the only way to set this up, of course. You could use animator layers, but I always had trouble getting that working right. You could also have bool parameters for one-handed, two-handed, etc, or perhaps even trigger parameters for those that you send along with the parameter for the action. 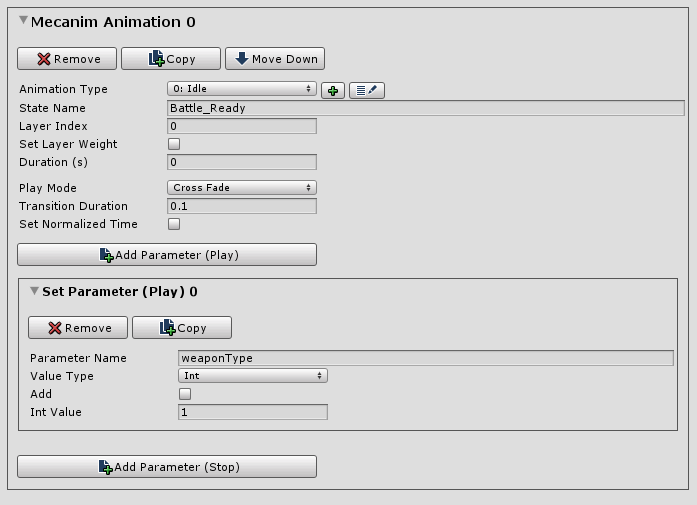 However, this quickly leads to a very long list of parameters in your controller, and you will have a lot more work to do to set up your animations in ORK. Also, it is a good idea to limit the number of transitions from AnyState, as it has to constantly evaluate all of the conditions attached to it. 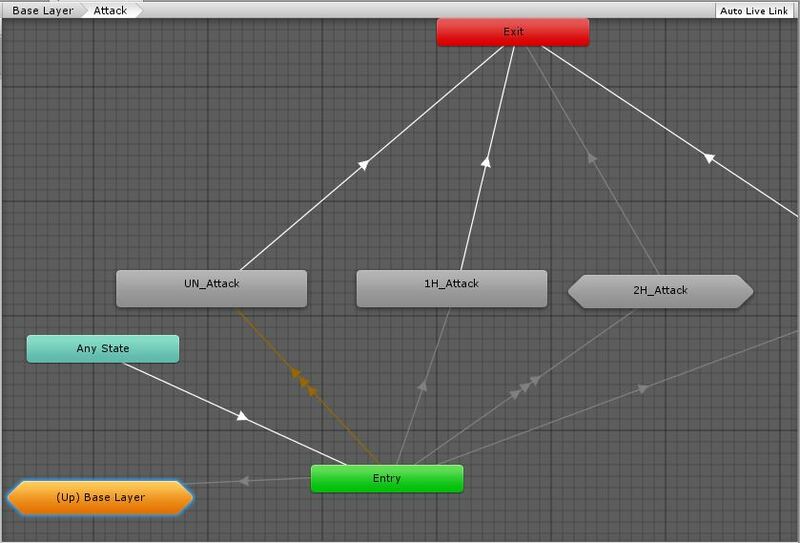 With this approach, AnyState only needs to be aware of what action is being taken (attack, damage, cast, etc); the appropriate sub-state machine handles evaluating which specific animation needs to be played. These don't need to transition to anything, and it doesn't matter which one is the default state of the sub-state machine, as nothing transitions to these either. This is simply a nice way to keep your parent state machine less cluttered. You shouldn't actually need to set the weaponType here, but it doesn't hurt to have it there. And that's really all you have to do on the ORK side. You can leave all of your actions (attack, cast, evade, etc) in the base set of animations. The weaponType checks in your animator will handle the rest. I'm not going to walk through setting up the rest of the actions, as they will all work the same way as the Attack sub-state machine. Of course, you can skip this for any animations where the type of weapon equipped doesn't matter. Now, this isn't quite enough to get this working all of the way. The animations work beautifully, but they don't affect the visibility of the equipment viewer on the character's right hand so the weapon stays visible. The other way is to set up an Animation Curve on your animation clip. Keep the curve fairly flat and then spike it at the frame where the visibility changes should happen. You'll need to set up a component on the character to watch for the spike in the curve and then toggle the equipment viewers. I haven't gotten around to doing this yet, but I'm 99% certain it will work. You can also chain together multiple animations if you need to make smoother transitions between your battle ready animation and whichever attack/cast/etc animation you want to play. I think it's actually pretty clean-looking considering the number of animations that it handles. I hope that some of you will find this tutorial useful. I welcome any questions or feedback! I left out the "Unarmed" Battle_Ready and Attack state machines because I haven't bothered to implement unarmed attacks in my game yet. Obviously it would be weaponType 0 and I would prefix all of its states with "UN_". I've actually been using weaponType 0 in a few places in my controller to differentiate between in-combat and out-of-combat, which is probably not a great idea. I've used it that way for the transitions out of the Cast_Spell state, where weaponType GreaterThan 0 transitions to Battle_Ready and weaponType LessThan 1 transitions to Idle. I think the better approach is to use weaponType -1 to designate out-of-battle and use that instead of 0 in your base Idle state. I'll make that change in my project and make sure it works, then I'll update this tutorial (and the images) and delete this note. Images seem to be broken. I'm looking into it. That's brilliant! Thanks for posting! I was actually going to convert to mecanim tonight and attempt to do this exact thing! This will take some of the pain out of trying to make a controller for 10 different wpn sets! WOOOOOT! Very nice, Thank you so much for the time and effort put into this. Answers an issue that I am about to tackle soon. Thanks again. 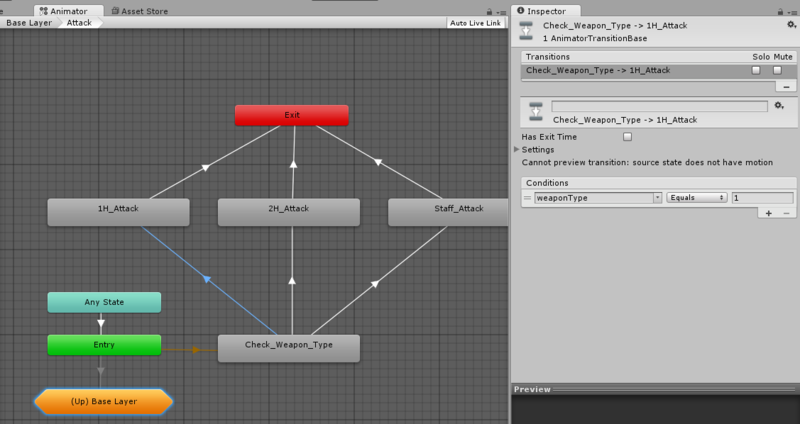 Just wanted to make a quick update to this tutorial: You can leave out the Check_Weapon_Type state and just set up those same transitions from the Entry node. This is better, as you can't accidentally have "Has Exit Time" checked, plus it isn't adding an extra timed transition; I ran into some issues with nesting sub-state machines where I had a frame of animation skipping because I had too many nodes that had no animation attached. Nested sub-state machines make it easier to do things like checking an additional parameter to determine which of the one-handed evade animations to play (for example). Do you mind if I ask a semi-related question? what's the best way to set up weapon-specific damage types? In other word I want a sword to be Slash damage by default, a spear to be Thrust, etc. Will I have to override the attack ability in each case? Or is there an easier way to do it with attack attribute bonuses? You could add a string variable to each weapon named something like damageType and then access it as Selected Data in events and formulas. Are you wanting to have this also determine if a slash or thrust animation is played? Coffee in the hand, and starting to implement this awesome tutorial to my game, thank you @Keldryn ! edit: On your updated message, that you don't need the check weapon state, how you determine which attack to make? again with the parameter checkweapontype? 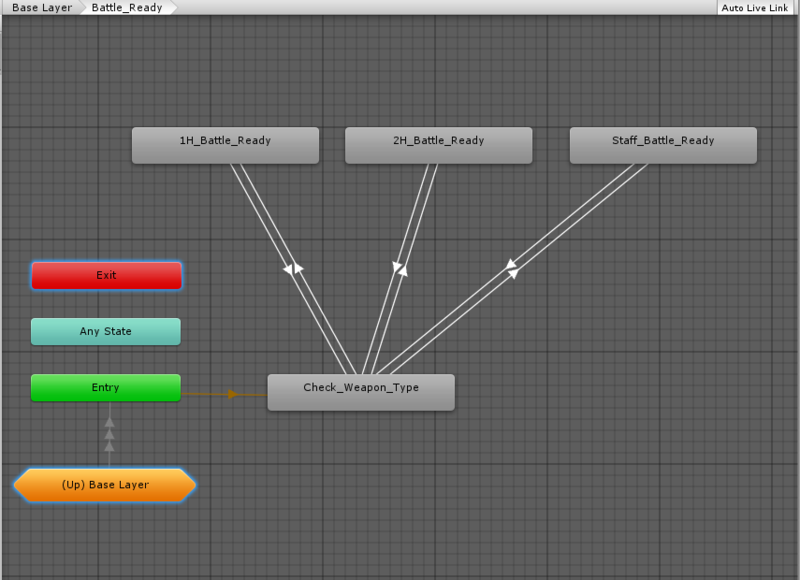 @dlevel Yes, set up the transitions exactly the same but directly off the Entry node. 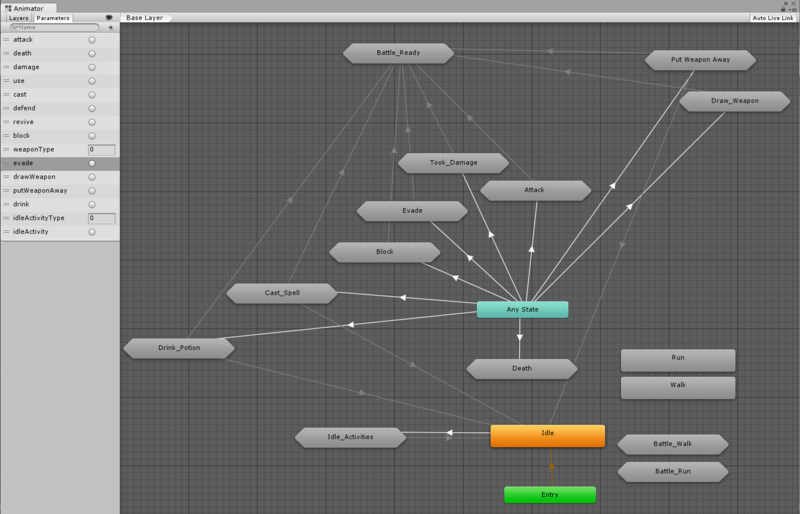 You don't need to create an empty node just to check the parameter. I learned so much from this tutorial about mechanim... thank you @Keldryn. One weird problem i got is that it works fine with the empty check node, and not with the entry node directly... also when i cast a spell or make an attack as i m running (without letting the UP key) then it doesn't transition to run again, any idea why is that? @keldryn am also using the medieval animation mega pack. But i noticed the pack doesn't have a 'combat mode walk animation' it only has 'combat run animation'. How did you deal with that. What animation did you use as your combat walk animation for lets say, 2w animation. @henkesky1 - I used the 2H_Cautious_walk animation, as it is well-suited to advancing towards a foe with weapon at the ready. I believe all of the melee animation sets have a "cautious walk" that blends nicely with the "combat mode" idle animation. @Keldryn When moving to sub states in your animator contoller, you set some triggers, like attack, block, revive e.t.c but you didn't use those trigger parameters in your ork set. You just used the integer values. Why did you add the triggers in the animator controller, if you know you won't use it. Is the name of the animation clip and int parameters enough for ork to find them? 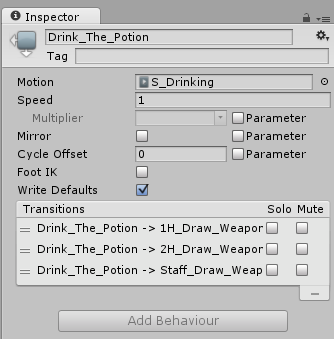 I did use the triggers in my ORK animation sets; the Walk, Run, and Idle don't use triggers as they are played by specifying the name of the state. 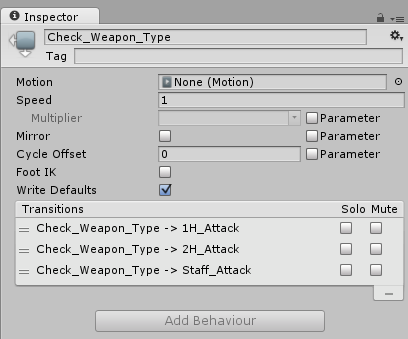 I set the weapon type parameter in the Idle states because that's always going to be played before any other animations. Near the beginning of the tutorial, I stated that it assumes you are familiar with Mecanim and have done the ORK Mecanim tutorial -- this is simply an extension of that setup. In the "pause to make sure we understand everything" section I talk about how the trigger parameter starts the Attack animation. @Keldryn Wow! that was very fast. I appreciate it. 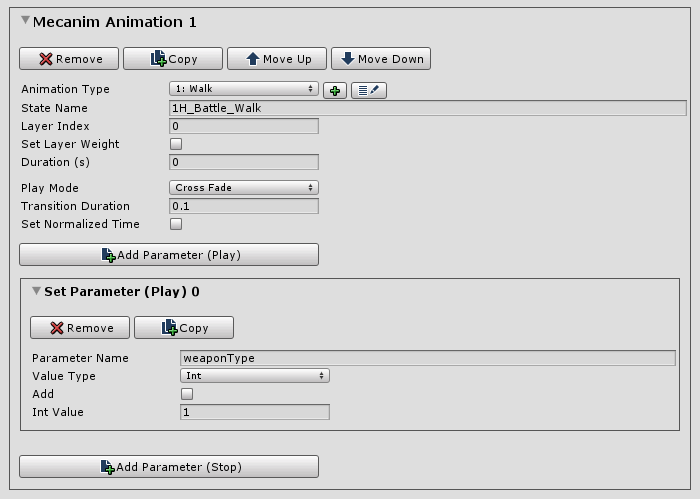 In other words, i can add two different parameter for attack animation in ork(Attack trigger parameter and theweaponType int parameter ). So if both values are true, the animation is played? You can set up the transitions to another Mecanim state with as many parameters as you need. In this case, the trigger parameter transitions from Any State to a partcular sub-state machine, such as Attack. Within the Attack SSM, we examine the int WeaponType parameter to see which animator state to transition to. An important note here is that an animator parameter retains its value once set until you change it again. Thus, we should be able to set the WeaponType once when the weapon is equipped. I was more or less assuming turn based when I wrote this, so the battle idle would be a nstural place for this. And this is where we can see the distinction between a trigger parameter and a boolean. A bool stays set to true or false until changed; a trigger simply executes and doesn't change any parameter values outside that frame. So in this setup, we use triggers to initiate each broad action (attack, block, etc) and the int parameter to determine the specific animation to play.